With our unique combination of phone service, technology, and expertise, and backed by our amazing PhonePro support, MercuryTel is the business phone platform you’ve been longing for. Scalable to meet the needs of organizations small and large, MercuryTel is packed with features, exceptionally customizable, and incredibly affordable. 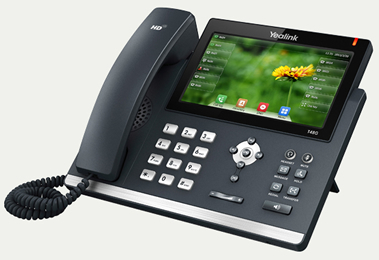 New Cisco®, Mitel® or Yealink® phones, unlimited calling to the USA and Canada, and on-site support are included in the fixed, monthly rate. Until now, having your own phone system was the only way to get the most advanced capabilities—but phone systems are expensive! As the technology ages, costly repairs and upgrades are required, and phone system dealers charge for every add, move and change. 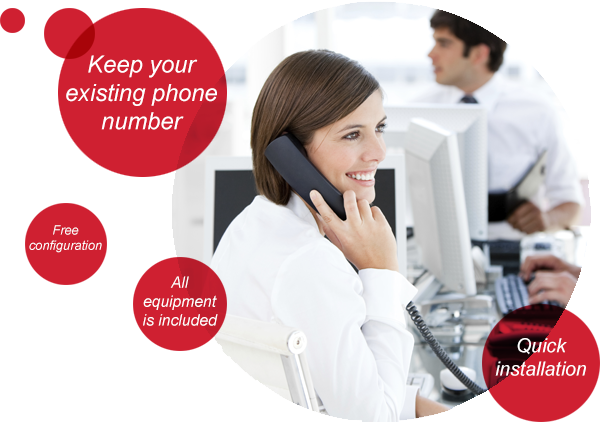 With MercuryTel, there is no phone system to buy and every feature is included at no extra charge! Your business will sound more professional, communicate more effectively and work more productively, without the big phone system expense. Whether you’re a small business just starting to grow, or a mature company with well-established needs, you get the features you need now and capabilities you can use in the future. Phone numbers available across the U.S.
Local and long-distance calls to the United States and Canada are included with our service, and calls everywhere else are just $0.15 per minute! We’re happy when you’re happy. If you’re not happy with your MercuryTel service, phone, or support, tell us and we’ll fix it. We promise to prioritize support requests in sensible ways. Business-affecting service calls get top priority. Should you need us on-site for a business-affecting service issue, we’ll be there as soon as possible. When you e-mail us, we promise to get back to you quickly, and always within 24 hours. We promise 100% MercuryTel phone switch availability. Cisco is a registered trademark of Cisco Systems, Inc. and/or its affiliates in the United States and certain other countries. Microsoft and Outlook are registered trademarks of Microsoft Corporation in the United States and/or other countries. Mitel is a registered trademark of Mitel Network Corporation. Yealink is a registered trademark of Xiamen YeaLink Network Technology Co., Ltd. Switching to MercuryTel is Five Easy Steps! Our Sales Professionals learn how phones are used in your business and are trained to identify features and technologies that can streamline your operations. We listen to what you like about your current phone system—and what you don’t—as well as your wishlist of new features to prescribe the equipment and services that will best meet the needs of your business. Our PhonePros come on-site to determine everything that’s needed to make your service work dependably and predictably, guaranteed. Our on-site analysis includes evaluations of your routers and switches, network connection, and cabling. Should you need cabling installed or upgraded, we do that too, and will provide you with a quote. We set up all menus, call queues, voice mailboxes, and other features you want, free of charge. If you currently have on-hold music or announcements digitally recorded, we can use them at no charge. Our PhonePros configure the phones, switches, and routers, and then come on-site to install them. We install everything so you know it’s installed right. The porting of your numbers is scheduled for the date of your choosing and professionally overseen by our PhonePros to ensure a seamless transfer. To make sure your switch to MercuryTel is smooth and successful, we station a PhonePro at your office on the day of turn-up so that we can make changes and address any training needs immediately. Does Mercury provide toll-free service? Yes. A $5.00 charge per toll-free number per month includes the first 60 minutes of use. Additional minutes are $0.03. Can I use Mercury for local calling and keep my existing long-distance carrier? MercuryTel service includes unlimited calling to the USA and Canada. There is no need for a separate long-distance company. No. All equipment is included in the monthly rate. I’ve used VoIP on Vonage, Skype, or a similar service and my calls kept cutting in and out. How is Mercury different? Mercury does not use public Internet connections for your phone calls but instead uses private network connections. In addition, our routers and switches prioritize phone calls ahead of data, ensuring a big download or upload doesn't kill your call. Our call flow is complicated. How much will you charge us for setting it up? Setup and configuration is free, no matter how complicated it is. 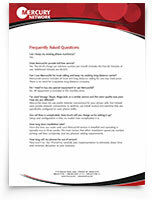 From the time you order until your MercuryTel service is installed and operating is typically two to three weeks. The main factors that affect installation speed are number porting, call flow complexity, and any physical cabling requirements. If numbers do not need to be ported and existing cable can be used, we can have you up and running in days. How long will my phones be out of service? They won’t be. Our PhonePros carefully plan implementation to eliminate down time and minimize disruption to your business. Use your high-speed internet connection to make and receive calls using your existing home phones. Call us today, 888.570.7727. Make the switch to MercuryTel! Get Started!